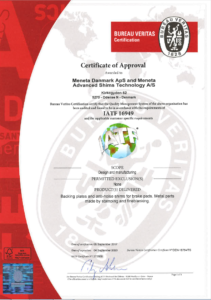 We are proud to be the first two Danish companies to be IATF 16949:2016 certified. 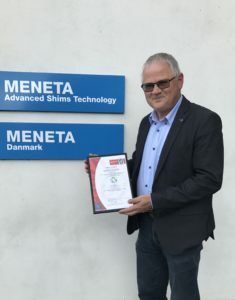 In our pursuit of the highest industry standards, our Danish companies have received the official certification one year ahead of the deadline for transition. This demonstrates our maturity and reliability, and means that we are able to shift focus from the quality management system itself towards increased product focus and our continued emphasis on creating value. Ultimately, everything revolves around insuring deliveries to our customers. As a global supplier to an increasingly complex automotive supply chain, our reliability is crucial to customer satisfaction. Being certified with the automotive industry’s most widely used standard ensures our adherence to stringent customer-specific requirements, and continued focus on risk reduction and manufacturing efficiency through industry best practices. Risk management and commitment of the top management are essential elements of the new standard. As the most widely used international standard in the automotive industry, the IATF 16949:2016 standard is harmonizing the different assessment and certification systems in the global automotive supply chain. Read more about the IATF:2016 standard here. Download our Certificate of Approval.